A Russian Navy Ka-27 flying by USS Vella Gulf over the Gulf of Aden. 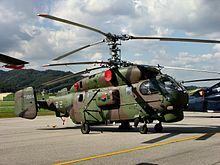 The Kamov Ka-27 (NATO reporting name 'Helix') is a military helicopter developed for the Soviet Navy, and currently in service in various countries including Russia, Ukraine, Vietnam, China, South Korea, and India. Variants include the Ka-29 assault transport, the Ka-28 downgraded export version, and the Ka-32 for civilian use. The helicopter was developed for ferrying and anti-submarine warfare. Design work began in 1969 and the first prototype flew in 1973. It was intended to replace the decade-old Kamov Ka-25, and is similar in appearance to its predecessor due to the requirements of fitting in the same hangar space. Like other Kamov military helicopters it has coaxial rotors, removing the need for a tail rotor. Ka-32 variants, e.g. the Klimov-powered Ka-32A11BC, have been certified for commercial operations throughout the world, notably in Canada and Europe. A Russian Navy Ka-27 helicopter from the Russian Udaloy-class destroyer Severomorsk conducted interoperability deck landing training on board the American command ship USS Mount Whitney on 22 July 2010. Ka-32A11BC multipurpose helicopters have been successfully operated in Portugal for over five years. In 2006, KAMOV JSC won the tender for the supply of Ka-32A11BC firefighting helicopters, to replace Aérospatiale SA 330 Pumas, which have very high operating costs. The Ka-32A11BC features a high power-to-weight ratio and ease of handling, owing to its coaxial rotor design. The rotors' diameters are not restricted by the presence of a tail rotor and associated tail boom; this facilitates maneuvering near obstacles and helps assure exceptional accuracy when hovering in heavy smoke and dust conditions. The Ka-32A11BC may be equipped with the Bambi Bucket suspended fire-fighting system of up to five tons capacity. The service life has been extended to up to 32,000 flight hours. Since the 1990s, China has purchased the Ka-28 export version and Ka-31 radar warning version for the PLAN fleet. 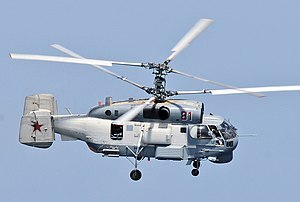 Ka-31 purchases were first revealed in 2010. It is believed that Chinese Ka-28s have been equipped with more enhanced avionics compared to Ka-28s exported to other countries. In 2013, Russia tested the new Kamov Ka-27M with an active electronically scanned array radar. The basis of the modernization of the Ka-27M is installed on the helicopter airborne radar with an active phased array antenna FH-A. This radar is part of the command and tactical radar system that combines several other systems: acoustic, magnetometric, signals intelligence and radar. All the information on them is displayed on the display instrumentation. Ka-32s are used for construction of transmission towers for overhead power lines, as it has somewhat higher lift capacity than the Vertol 107. In Canada, the Ka-32 is used for selective logging as it is able to lift selective species vertically. In August 2013, a Kamov Ka-32, C-GKHL operating in Bella Coola, British Columbia, Canada, experienced failure of one of its Klimov TV3-117BMA engines (manufactured by Motor Sich in Ukraine). The subsequent technical investigation indicated that there was poor quality control in the assembly of the compressor turbine, leading to failure of the complete unit after several compressor blades separated. Ka-27s have been used by the Syrian Navy during the ongoing Syrian Civil War. (Helix-D) Search and rescue helicopter, ASW equipment removed and winch fitted. Armed version of the Ka-27PS. The latest modification of the helicopter, equipped with radar and tactical command systems that include the following systems: acoustic sensors, magnetometric sensors, signals intelligence, and FH-A radar with active phased array antenna. The radar is mounted under the fuselage and provides all-around vision in the search and detection of surface, air, and ground targets. Serial upgrading of Ka-27Ms to the level of combatant helicopters was planned to begin in 2014. By the end of 2016, 46 Ka-27PLs had been scheduled for modernization, commissioned by the Russian Navy. The first eight serial Ka-27M were transferred in December 2016. Mass production approved in June 2017 and started in early 2018. A new delivery of 5 helos in October 2018. Half of the fleet is modernized as of December 2018. (Helix-A) Export version of the Ka-27PL. Heliswiss Ka-32 installs digital-TV transmitter in Århus, Denmark. (Helix-B) Assault transport helicopter, with accommodation for two pilots and 16 troops. A radar picket variant of the Ka-31 early warning helicopter first displayed in 2008. RLD designation: radiolokatsyonnogo dozora. Two units delivered to Russian MoD by 2010. Civil transport helicopter. Initial production version. Fire fighting helicopter, equipped with a helicopter bucket. Police version, equipped with two searchlights and a loudspeaker. Special search and rescue, salvage and evacuation version. Armed version developed from the Ka-27PS. Canadian, Chinese, European-certified version with Klimov TV3-117MA engines and Glass Cockpit. Projected development with 1839kW TV3-117VMA-SB3 engines. Probably replaced by the Ka-32-10 project. (Helix-C) Maritime utility transport, search and rescue helicopter, fitted with an undernose radar. (Helix-C) Utility transport helicopter, with accommodation for two crew and 16 passengers. Flying crane helicopter, fitted with a retractable gondola for a second pilot. Capacity: 4,000 kg (8,818 lb) payload (Ka-32), or up to 16 troops (Ka-29). ^ Nealy, Sylvia (27 July 2010). "Russian Navy conducts flight training aboard US ship". Rotorhub. Retrieved 4 August 2010. ^ "KAMOV Ka-32". omundodaprogramacao.com. Retrieved 6 June 2013. ^ "Ka-28 Ka-31 in Chinese navy". AirForceWorld.com. Retrieved 7 June 2013. ^ "VIH Aviation Group – Pride in Service since 1955". www.vih.com. ^ Canada, Government of Canada, Transportation Safety Board of. "Aviation Investigation Report A13P0163 – Transportation Safety Board of Canada". www.tsb.gc.ca. ^ "S. Damascus: rare insight of a Syrian Navy Ka-27 dropping bombs on Khan As-Sheih pocket - Map of Syrian Civil War - Syria news today - syria.liveuamap.com". Map of Syrian Civil War - Syria news today - syria.liveuamap.com. ^ bmpd (21 December 2016). "Первый серийно модернизированный противолодочный вертолет Ка-27М". ^ "Russia's naval aviation receives 8 upgraded Ka-27M deck-based helicopters". ^ "Modernized Ka-27M helicopters for the Russian Ministry of Defense". 22 August 2017. ^ "Russian Helicopters deliver upgraded Ka-27Ms to Defense Ministry". ^ "Naval aviation to receive about 50 modernised Ka-27 helicopters : Ministry of Defence of the Russian Federation". eng.mil.ru. ^ "Ka helicopters for sale. Ka 32, Ka 62, Ka 226. Buy ka helicopter in Russia and World". kahelicopter.com. ^ a b c d e f g h i j "World Air Forces 2018". Flightglobal Insight. 2018. Retrieved 16 June 2018. ^ "Korea Coast Guard 2012 White Paper". Archived from the original on 5 November 2013. Retrieved 6 June 2013. ^ "[산림청] 소방헬기 자료". 12 January 2012. ^ "Helicargo Services". helicargo.com.br. Retrieved 5 April 2013. ^ "From Russia With Love". Annex Business Media. Retrieved 5 November 2013. ^ "Heli Swiss Fleet". heliswissinternational.ch. Archived from the original on 3 March 2016. Retrieved 5 April 2013. ^ "Aircraft fleet". akagi-heli.co.jp. Retrieved 5 April 2013. ^ "Kamov Ka-27 Helix". www.helis.com. Retrieved 9 May 2012. ^ "Kamov KA-27 Helix". www.combataircraft.com. Retrieved 9 May 2012. Wikimedia Commons has media related to Kamov Ka-27. This page was last edited on 2 February 2019, at 00:20 (UTC).